Cardinal Ouellet, 66, will head the office that helps the pope choose bishops for Latin-rite dioceses around the world. It's the first time a North American cardinal has been placed in charge of the powerful congregation. The pope also named Italian Archbishop Rino Fisichella as president of a newly created agency, the Pontifical Council for Promoting New Evangelization. He named Spanish Msgr. Ignacio Carrasco de Paula, a member of Opus Dei, to replace Archbishop Fisichella as president of the Pontifical Academy for Life. The appointments were announced June 30. Vatican officials said that on July 1, the pope would formally name Swiss Bishop Kurt Koch as president of the Pontifical Council for Promoting Christian Unity, replacing German Cardinal Walter Kasper, who had headed the council since 2001. Cardinal Ouellet, who succeeds 76-year-old Italian Cardinal Giovanni Battista Re, is not a stranger to Rome or to the Roman Curia. He studied in Rome and returned to the city to teach in 1996. A year later, he was appointed chair of dogmatic theology at the John Paul II Institute for Studies on Marriage and the Family. Cardinal Ouellet has been involved with the theological journal, Communio: International Catholic Review (which was co-founded by Joseph Ratzinger, Hans Urs von Balthasar, etc. ), for many years as both an editorial board member and author. The editors of Communio have put together a page of links to various articles by Cardinal Ouellet, including essays on the uniqueness of Christ, Mary and ecumenism, the significance of the Catechism of the Catholic Church, preaching and evangelization, and marriage. Books and Films on Spiritual Warfare at 20% off! Offer ends Tuesday, July 6th, 2010 at 12:00 midnight EST. 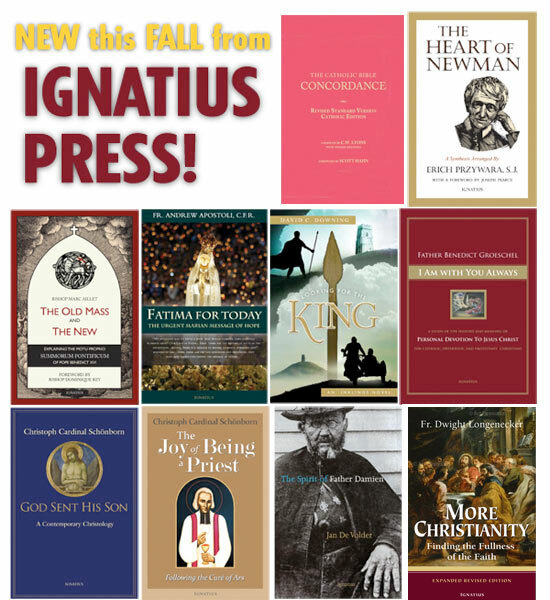 Ignatius Press has partnered with Fr. 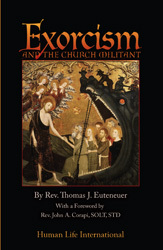 Thomas Euteneuer, an Exorcist who is also the President of Human Life International, to distribute his powerful new book, Exorcism and the Church Militant. With a Foreword by Fr. John Corapi, this in-depth compendium on all the important teachings about exorcism presents an insider's perspective on the Church's warfare against the enemy of our souls. We are offering this major new work at 20% off here, along with many other great books and films connected with the subject of spiritual warfare and how to best equip ourselves for this daily spiritual battle against the powers of evil. 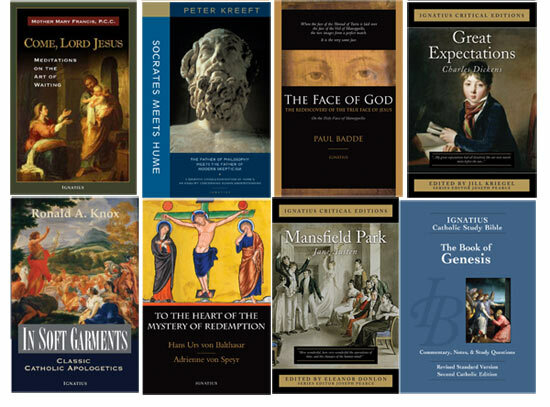 So pick up a copy today of Father Euteneuer's powerful new book, as well as some of the other select books & films in our list below. 20% for a limited time! The phenomenon of demonic possession is one of the most frightening realities of the fallen human condition—and one of the most misunderstood. For those who seek insight into this serious aspect of the Christian faith, Fr. Euteneuer, an exorcist who has performed numerous exorcisms as well as dozens of deliverances on afflicted persons, has compiled an in-depth compendium of the basic teachings about exorcism, which will give the reader an insider’s perspective on the Church’s warfare against the enemy of our souls. This major work on exorcism includes copious footnotes, an extensive index, nine appendices, and eight pages of bibliography. Chapters include “Jesus, Chief Exorcist”, “Exorcism and Church Authority”, “Healing and Deliverance”, “The Conduct of Exorcism”, “Pastoral Considerations” and more. In this powerful book, the renowned exorcist of Rome tells of his many experiences in his ministry as an exorcist doing battle with Satan to relieve the great suffering of people in the grip of evil. The importance of the ministry to "expel demons" is clearly seen in the Gospels, from the actions of the Apostles, and from Church history. Fr. Amorth allows the reader to witness the activities of the exorcist, to experience what an exorcist sees and does. Following up his international best-selling book, An Exorcist Tells His Story, Fr. Gabriele Amorth, the renowned chief exorcist of Rome, expands on some of the key topics of his previous book, covering important details about demonic or occult issues. Are you a "great statesman and public servant"? Go straight to heaven! UPDATE: Judie Brown of the American Life League also addresses Bishop Bransfield's statement. Today our nation marks the passing of a great statesman and public servant, Senator Robert C. Byrd. While we will prayerfully reflect on his decades of scholarship, hard work, and dedication to the people of West Virginia, we must also celebrate the future that Senator Byrd helped shape. Senator Byrd led the transformation of West Virginia’s highways, and technology, health care, education and criminal justice systems, which will advance the quality of life in our beloved state for generations to come. Byrd once served briefly as an "exalted cyclops" in the Ku Klux Klan and personally conducted a 14-hour filibuster against the Civil Rights Act of 1965, but he later modified his stand on civil rights. Both Obama, a former U.S. senator from Illinois, and Secretary of State Hillary Rodham Clinton praised Byrd for his generosity toward those who were new to the Senate. "He held the deepest respect of members of both parties, and he was generous with his time and advice, something I appreciated greatly as a young senator," Obama said. SAN DIEGO (AP) -- The son of a Hamas founder who became a Christian and an Israeli spy will be granted U.S. asylum after he passes a routine background check, an immigration judge ruled Wednesday. Mosab Hassan Yousef got the news during a 15-minute deportation hearing after a U.S. Department of Homeland Security attorney said the government was dropping its objections. "I will keep fighting the ideology that is behind terrorists because I know how they think," he said outside the courtroom. Yousef, 32, said he could not explain the government's abrupt decision, but said authorities may have had second thoughts after reviewing his case more closely. Yousef is the son of Sheikh Hassan Yousef, a Hamas founder, and was groomed to follow in his father’s footsteps. At the age of 18, he purchased some machine guns and planned to join the terrorist organization’s militant wing. But he was arrested with the guns, and during a stint in Israeli prison, he had a change of heart — and joined Hamas as an undercover agent of the Israeli intelligence agency Shin Bet after his release from prison in 1997. In 2007, he came to the U.S. and applied for asylum. The U.S. Citizenship and Immigration Service denied his application in 2009, on the grounds that he provided material support to a terrorist organization. This is madness. Not that long ago, it seemed inevitable that the son would follow in his father’s footsteps. As [Yousef] recounts in Son of Hamas, a stunning and instructive memoir, at the age of 17 he “could think of nothing except joining the military wing of Hamas.” But he came to see terrorism as immoral and repugnant, and, in reaction, he embarked on a remarkable journey. Yousef is now a Christian, and his story, Son of Hamas: A Gripping Account of Terror, Betrayal, Political Intrigue, Unthinkable Choices (Tyndale), is available through Ignatius Press. VATICAN CITY, 30 JUN 2010 (VIS) - In the light of the recently-concluded Year for Priests, Benedict XVI dedicated his catechesis during this morning's general audience to the Italian St. Joseph Cafasso (1811-1860), the hundred and fiftieth anniversary of whose death fell last week. Joseph Cafasso first studied philosophy and theology then, four months after his priestly ordination in 1833, entered the "St. Francis of Assisi" institute in Turin, Italy, to perfect his skill in pastoral care. The kind of ministry that Joseph Cafasso helped to establish, said the Pope, was "that of the true pastor with a rich interior life and a profound zeal for pastoral care: faithful in prayer, committed to preaching and catechesis, dedicated to the Sacraments of the Eucharist and Confession, in keeping with the model incarnated by St. Charles Borromeo and St . Francis of Sales, and promoted by the Council of Trent". "St. Joseph Cafasso sought to establish this model in the formation of young priests so that, in their turn, they too could become formators to other priests, religious and lay people, thus creating a unique and effective chain". The saint, who passed many hours in the confessional, "loved the Lord totally, he was animated by a well-rooted faith and supported by profound and prolonged prayer, he showed sincere charity to everyone. He knew moral theology but was equally well aware of the condition of people's hearts for which, like the good shepherd, he took responsibility". Recalling then that St. Joseph Cafasso was St. John Bosco's spiritual director from 1835 to 1860, Benedict XVI explained that at no time did the former seek to make the latter "a disciple in his image and likeness", while St. John Bosco never copied his master. "He imitated him in the human and priestly virtues - defining him as a 'model of priestly life' - but maintained his own attitudes and his own specific vocation. ... This is a precious lesson for those involved in the formation and education of the young generations", said the Pope. Another element that characterised the ministry of St. Joseph Cafasso was his "concern for the lowest, especially for prisoners ... who lived in inhuman and dehumanising conditions". If at first, in his preaching to prisoners, the saint "often delivered great sermons that came to involve almost the entire prison population, with the passage of time he came to favour individual catechesis, made up of conversations and personal meetings. While respecting the individual situation of each individual, he tackled the great themes of Christian life, speaking of trust in God, adherence to His will, the utility of prayer and the Sacraments, the culmination of which is Confession, the meeting with God Who, for us, becomes infinite mercy". He died in the year 1860. In 1948 Pope Pius XII proclaimed him as patron of Italian prisons and, in 1950, propsed him "as a model for priests involved in Confession and spiritual direction". In his greetings at the end of his audience, the Pope addressed special greetings to the metropolitan archbishops who yesterday received the pallium, and to the pilgrims accompanying them. Let's hear it for James MacMillan! I regret to say that the most eager acceptance of the new hectoring political puerilities are to be found in The Arts. This has its roots in Romanticism, of course, but a gradual systemisation of radical politics settled in the early 20th century. Think of how, from the 1920s, groups such as Imagists, Vorticists, Futurists, Surrealists, Expressionists habitually declare their commitment to Revolution. Yes, any old revolution would do, but as long as it overturned manners and lifestyles as well as aesthetics and politics. This has nothing to do with a love of life, a love of the poor or the outsider, but all to do with a love of transgression. It becomes addictive and in the past has led artists as much to the extreme Right as to the far Left. Childish “anti-bourgeois” militancy has no political intelligence or moral fibre. Witness, for example, Harold Pinter’s descent into infantilism every time he mentioned the United States, or for that matter decide to write poetry. Rather than being ridiculed for the embarrassing doggerel-merchant he had become, he was lauded to the highest by his fellow-travellers, easily impressed by easy rhetoric and equally determined to maintain their favoured positions in the back-slapping arts establishment. The legacy of this militancy can be seen nowadays in “arts criticism” and the rise of a secular priesthood. The common purpose of this new cultural élite is to attack the institutions and principles of our shared common life. What passes in Britain for an intelligentsia has appropriated the Arts for their own designs — a recent debate at the South Bank proclaimed “All Modern Art Is Left Wing”. No dissent from the party line goes unpunished. What we are seeing here is a cultural regime which adjudicates artists and their work on the basis of how they contribute to the remodelling, indeed the overthrow of society’s core institutions and ethics. I attended two years of art school twenty years ago in places (Arizona, Idaho) that would considered "conservative" by most people, and I can attest to how immature, self-congratulatory, shallow-thinking, and anti-Christian are most 18-25 year-old "artists" (maybe one or two could actually make some vaguely legitimate claim to that descriptive). So I can barely imagine how nasty it is in, say, London or New York City. Christianity is indeed full of problems, loopholes, and moral issues. Anyone who reads the Bible will quickly discern all the ethical, moral, and intellectual problems that it contains, which are all problems in and of themselves. That said, the biggest problem with Christianity is the concept of eternity and who spends eternity where. I say we wait until we both die, and then argue about it afterwards. Deal? Let's back up for a minute and see who all is in hell. Wow, you can do that? By backing up? What sort of rear-view mirror do you have in that Atheist Hummer? Or are you merely employing backward thinking? Yeah, of course you are! Let's take a few names of some non-Christian people who influenced society for the better: Gandhi (Hindu), Abraham Lincoln (Deist), Confucius (made sort of his own religion), Susan B. Anthony (atheist), Andrew Carnegie (atheist), Elizabeth Cady-Stanton (atheist). None of the above were Christians, yet they did great things for society. Guess where they are? You guessed it, they're burning in hell. Now let's see who all's in heaven, shall we? Names like Adolf Hitler (Roman Catholic), Timothy McVeigh (a professing Christian), Jeffrey Dahmer (a fundamentalist Christian), David Berkowitz (a professing born-again Christian), Bruce Lee (another professing Christian). What do all of these names have in common? Of course, they are all serial killers. However, they were all Christians, and Christians go to heaven because Jesus supposedly atones for all sins, no matter how great. Because we all know how prevalent are those sermons condemning Abraham Lincoln to eternal damnation while praising God that the Führer is playing a harp on a cloud somewhere. But most shocking is finding out that Bruce Lee was a serial killer and a confessing Christian. Who knew?! So now we see the really big problem here. Yes, we sure do. But you don't. All of these evil men are in heaven because they happened to believe in Jesus as the savior and messiah and got off scot-free despite their evil deeds. The people in the former group were truly wonderful people, humanitarians who contributed to and advanced society. Despite their good works, because they didn't happen to believe that Jesus was it, they're all burning in hell. That and $3.99, folks, will get you 227 comments and this delicious Northwest beverage. "There is therefore a guarantee of freedom promised by God to the Church..."
“Indeed, if we think of the two millennia of Church history, we can see that - as the Lord Jesus had announced, Christians have never been lacking in trials, which in some periods and places have assumed the character of real persecution. “These, however, despite the suffering they cause, are not the greatest danger for the Church,” the Pope said. Read the entire report on EWTN News. Today in Rome, on the Feast of Sts. Peter and Paul, Pope Benedict XVI gave a remarkable homily in which he mentions the threats that will come against the Church in the "last days." The homily thus provides a deep insight into Benedict's mind at this troubled moment in his pontificate. "The Petrine aspect perhaps appears nowhere more clearly than in Paul"
The bursting of all comprehensible models in the constellation around Jesus can become most perplexing to human reason. Take the seeming contradiction introduced by the call of Paul to an apostolate that ranks with that of the Twelve. He has to fight hard for it, all the more so because his vision of the Risen One, which makes him and his mission coequal with the first witnesses, is of a totally different kind. Paul is and remains supernumerary, because with the election of Matthias his place has already been filled. And yet he is legitimate, even among the "superapostles", "even though I am nothing" (2 Cor 12:11). He is indeed "nothing", for the heavenly Jerusalem remains built upon twelve foundation stones, and no provision is made for a thirteenth gate (Rev 21:14). And yet the lion's share falls to him in his apostolate and his theological grasp of the mysterium of Christ; he is associated with Luke and Mark; his exploits make up the largest part of the Acts of the Apostles. Paul represents the "Passion of Christ" to the communities and for them, so he himself becomes a "type" as he models himself on the "type" of Christ. Not only does this introduce an unprecedented existential mediation—prelude to the great missioning of saints in Church history—but also an unheard-of clarification of what will be called office and authority in the Church. Again, the two sides are inseparable from each other. Paulinism is not only what Luther extracted as "doctrine" from the Letters to the Romans and Galatians but also that other part which deals with Church government in the Letters to the Corinthians, which sounds more authoritarian than any successor of Peter would have dared to be. (How mild the Letters of Clement sound by comparison!) This, naturally, is of more than merely antiquarian interest for the later Church: so this was the way the charismatic Church of Corinth was really ruled with the assistance of the Holy Spirit! But authority in the Church, the precise anatomy of which Paul has made plain, theologically as well as pastorally, for all ages of the Church on the basis of his own experience, is just as distinctively marked by the unique Christ-event as was the earlier Peter-John "structure": it is an authority that proceeds in harmony with the community and—using all the resources of charity, with a heartfelt and ministerial love and a trusting reference to the immanence of Christ's Spirit in the faithful (2 Cor 13:5)—strives to create communio. It threatens with a regrettable but legitimate "naked" authority only in the extreme instance when the apostle does not find in the community the proper loving obedience required by faith (2 Cor 12:20-21). Just as Peter builds on John and John is within (and beside) Peter, the Petrine aspect perhaps appears nowhere more clearly than in Paul. Conversely, Pauline influence is unmistakable in Peter's letters,  which are evidently intended to transmit wholly Petrine tradition. Again, we see two striking figures (who do not in the least blur each other and who have distinct theological and ecclesiological valences) in perichoresis, nor could it be otherwise among the members of the "living Body of Christ". Still, not every member communicates in the same way with the other. Within the manifest structure (which we stress is not definable in terms of tight distinctions) there are delicate lines of relation, most clearly drawn and represented by Luke and John. Luke portrays a family relationship between Mary and the Baptist, and, as Paul's companion, he circumspectly builds a bridge between the latter and the Gospel tradition. Luke and John both bring to light deep, hidden mariological dimensions. In the episode at the foot of the Cross, told only by John, he who in the beginning of the Acts of the Apostles is always shown together with Peter becomes "son" and guardian of the Mother. Thus he is shifted into a discrete but totally indispensable central position (mediating between Peter and Mary, between the official, masculine Church and the feminine Church) that alone can give these two dimensions of the Church's mysterium their place and proportion. Only where these concrete proportions are seen, understood and meditated upon in the light of faith, can one speak to advantage about the office of Peter in the Church. Moreover, this cannot be isolated from its most intimate connection with and within the collegium of the Twelve, each of whom was explicitly called by name. Ernst Käsemann, "Die Legitimität des Apotels", in Zeitschrift für Neutestamentliche Wissenschaft 41, (1942). K. H. Schelkle, Die Petrusbriefe, der Judasbrief (Freiburg im Breisgau: Herder, 1961), 5ff. ; cf. the entries under "Paulusbriefe" in the index. The mother of my favorite canon lawyer and canon law professor, Dr. Ed Peters ("In the Light of the Law"), and grandmother of Thomas Peters (aka, "The American Papist"), has died after a lengthy illness. I'm looking for a classical music recommendation, and I think that you would be a good person to ask. Despite my very large and fairly diverse CD collection (though not nearly as large as your collection), I own only a handful of classical CDs. I have Stravinsky's Firebird Suite and Rite of Spring, Beethoven's 5th and 6th symphonies, Mahler's 1st and 2nd symphonies, Shostakovich's 5th symphony, Mussorgsky's Pictures at an Exhibition, and just a few others. I'm not looking to greatly expand my classical collection. However I have known for quite some time that I am completely missing two of the best and most essential classical composers, namely Bach and Mozart. Can you recommend a few "essential" CDs of Bach and Mozart for me to buy -- preferably narrowed down to no more than two or three CDs for each composer if that is possible? "We can always follow Peter"
"We can always follow Peter" | The Introduction to Simon, Called Peter: In The Company of a Man In Search of God | Dom Mauro-Giuseppe Lepori, O.Cist. "And when they had brought their boats to land, they left everything and followed him" (Lk 5:11). Is there anyone who is not moved by the witness of absolute dedication to Christ? This is the allure of the saints, whom the Church never tires of contemplating and of presenting as proof that it is possible to follow Jesus Christ with our entire selves, that it is possible to make a radical commitment to the Son of God, "the way, the truth, and the life" of man. The saints address our desire for the fullness of life and tell us that this is not an illusion, that it is not a mirage, but a call that resounds in the heart of every man and requires fulfillment. The answer to this desire is not a dream but rather the realism of following Christ. The realism of following Christ is demonstrated by the saints, those who followed him before us, leading us on toward him in an invisible chain stretching from the first steps of Mary and the apostles throughout all of history, until the Second Coming. "They left everything and followed him." The allure of this radical response is lost unless we ourselves are moved by what we see in the saints and ask ourselves, "What does leaving everything to follow the Lord mean for us?" The saints teach us that the answer to this question is not the same for everyone. The saints teach us that "leaving everything" does not come before the act of following—instead, these two things happen at the same time. Leaving everything is done not only at the beginning but during the entire journey. Only death confirms, once and for all, our leaving everything behind in order to be with the Lord forever. Following him is a constant, renewed "leaving everything". It is never finished and continually requires a fresh commitment, as if each of the Lord's footsteps created another "everything" between himself and our freedom, a new "everything" to be left behind once again. This is how the love of Christ continues to live and grow. • Come, Lord Jesus: Meditations on the Art of Waiting, by Mother Mary Francis, P.C.C. • Fatima For Today: The Urgent Marian Message of Hope, by Fr. Andrew Apostoli, C.F.R. In a too crowded age -- I refer, not to the multiplication of mortal lives, but to the multiplicity of human interests -- it is an uneasy business to estimate tendencies or to prophesy developments. So many agitators, publicists, and quack physicians, each with his own platform and his own audience, din into our ears the importance of a thousand rival or unconnected movements, so ruled by chance is the sub-editor's preference for this or that head-line, the loyalty of the public towards the catchwords it favoured yesterday, that a wise man might well ask to be excused the task of pronouncing upon the chaos, or of guessing the outcome. Last century, for instance, one thing seemed luminously clear, that Liberalism was advancing, and was bound to advance, in a constant ratio of progress. Does Europe, does England, ratify that opinion now? And if there has been a reaction, is the defeat final or temporary? Which of the modern movements are genuine currents, which the backwash of a flood? Which of our modern evils are symptoms, and which are organic diseases? Which of our modern results are the true offspring of an age, which are sports and freaks of history? Historians of to-morrow, excuse our frantic guess-work in your clearer vision. Amidst the tangle, one strand seems to define itself -- within the last hundred years, within the last fifty years, within the last twenty-five years, the force of religion, as a factor in English public life, has steadily and visibly declined. I do not mean that a careless and external diagnosis would detect the change. Within the last few years we have seen, perhaps, a greater output of religious discussion in public print than any age since the Reformation. But this itch for religious discussion, which is peculiarly British, is not really an encouraging symptom. Men do not talk about their health when their health is strongest; a nation does not talk about its religion when its religion is flourishing. Statistics, it is true, may be misleading, but they are the thermometer of change. And any statistical comparison I have ever undertaken, or seen undertaken, seems to yield the same result--namely, that the area of lives visibly affected by habits of religion shrinks from decade to decade, and almost from year to year. To take an instance at random -- Trollope, in his "Vicar of Bullhampton" ( published in 1870), writes of a London population "not a fourth of whom attend divine service." Is it not the impression most of us would record, after a Sunday morning spent in the metropolis, that to-day we should have to write "a tenth" instead of "a fourth"? Our culture is in crisis. The future of marriage and family is in jeopardy; our ability to protect the poor and vulnerable is being compromised; and our religious freedom is being slowly taken away. Instead of relying on the government to provide a solution, what can we do to restore our disintegrating Judeo-Christian society? Join great thinkers as they reveal the underlying issues that are contributing to the collapse of our culture and remind us that we are not the first to have faced these problems. Listen as they show us that we do indeed have the intellectual and moral resources to Reclaim the Culture. Tune in each week to Immaculate Heart Radio as Dolores Meehan interviews renowned thinkers such as Father Joseph Fessio, SJ; Fr. Michael Sweeney, OP; Professor Janet Smith; Father Robert A. Sirico, Professor Maria Fedoryka, author Mary Eberstadt, Bishop Salvatore Cordileone and others on all aspects of the crises facing our culture: moral, social, political, and economic. • July 12: Bishop Salvatore Cordileone, of Oakland, on “The Manhattan Declaration: A Call to Christian Conscience." • July 26, bioethicist/author Dr. Janet Smith, of Sacred Heart Major Seminary on “The Right to Privacy”--about her book of the same title (available from Ignatius Press). • and the renowned authors and thinkers Mrs. Mary Eberstadt, Dr. Jennifer Roback Morse, and Dr. Anthony Esolen. Today’s readings, especially the Old Testament and Gospel readings, describe the call and work of God’s prophets. As good fortune would have it, I set out to write this column after having read the first several pages of Pope Benedict XVI’s book, Jesus of Nazareth. False prophets, whether ancient or modern day, attempt to explain what will happen next week, month, or year. True prophets did the same, but always within the larger context of God’s work—both here and now and in the great panorama of salvation history. The false prophet lives for himself, tickling the ears of those who engage his services; the true prophet dies to himself and challenges his listeners with a message that can often sound harsh, even impossible. The basic message of the prophet is, “Follow God. Obey Him. No matter what.” And the prophet didn’t simply say so—he lived so, often in dramatic fashion. And so Elisha not only left the field and yoke but also slaughtered his oxen. Answering the call of God means realizing and demonstrating there is no going back. The end of the ninth chapter of Luke marks a key transition, for Jesus was setting forth to Jerusalem with a steely resolve, having, the Greek text states, “hardened his face to go” on His exodus, spoken of at the Transfiguration by Moses and Elijah (Lk. 9:31). Like Ezekiel, Jesus was resolved to “prophesy against the land of Israel” (Ezek. 21:7-8). Having spent the first part of His ministry performing miracles, His work from that point forward consisted mostly of preaching to three different groups: the disciples, the crowds, and the Pharisees. Encountering difficulties from the Samaritans—who claimed to have preserved the original, authentic Mosaic religion—the disciples referred back to Elijah, who had called down fire upon his enemies (2 Kgs. 1:10). Jesus rebuked them; His work is not to kill or destroy, “but to seek and to save what was lost” (Lk. 19:10). Yet this doesn’t mean the call to discipleship is easy to understand and embrace. On the contrary, Jesus’ responses to three anonymous interlocutors are demanding, even bewilderingly so, stressing the all-or-nothing nature of following Jesus. The hyperbolic nature of Jesus’ responses is meant to shake up those who think they are ready to follow. “Let the dead bury their dead,” has often been interpreted to mean that those who are spiritually dead will deal with the physically dead. Some must choose between their earthly families and the family of God; all of must choose to either follow Jesus or walk away from Him. There are no other options. “Becoming a disciple of Jesus,” the Catechism states, “means accepting the invitation to belong to God's family, to live in conformity with His way of life” (CCC 2233). The Prophet has shown the way to God. Will we walk it? Her story was considered so subversive that for centuries the Vatican tried to expunge it from the records. Now a film, which last week reached the top 10 box office list in Italy, has revived the story of Pope Joan - an Englishwoman who, legend has it, disguised herself as a man and became the only female pontiff. The film will fuel debate over whether Pope Joan really existed or whether, as the Catholic Church maintains, she was a mythical figure used by the early Protestants to discredit and embarrass Rome. For a church that even today remains staunchly opposed to the idea of female priests, a female pope is anathema. Impossible, actually, just as pizza and soda consecrated by a priest can never be the Eucharist, no matter how hip and trendy he might consider it to be. No amount of Church authority, pomp, or ceremony could ever make a woman (nor, for that matter, non-ordained lay person, etc.) pope, just as no amount of court rulings and gnashing of teeth by Those Who Know Best About the Need For Progress can make the union of two men or two women a marriage. Anyhow, I've not been able to find information about whether or not the movie will play in North America, but I assume it will make its way to DVD at some point. Pope Joan is one of the most tenacious myths of the Middle Ages, told and retold by Catholics and anti-Catholics alike since the 13th century. It is said that beautiful young Joan, an Englishwoman born in Mainz, Germany, disguised herself as a man to gain higher education beside her scholarly lover. Her brilliance won her election as pope under the name John in 855 (some say 1100). After reigning less than three years, she bore a child during a papal procession and died immediately, either from childbirth or stoning. Subsequent popes are supposed to have avoided this shameful place and had their maleness verified during their coronation ceremonies, during which an inscription was read as a commemoration of Joan: "Peter, Father of Fathers, Publish the Parturition of the Popess." Though long disproved by historians, this scandalous legend still requires an occasional rebuttal by Catholic apologists. But its relevance has been renewed by the clamor for women’s ordination and contemporary enthusiasm for gender-bending. Among past novels, Donna Woolfolkcross’s Pope Joan has been re-issued as a movie tie-in, and the ex-nun posing as a priest in Louise Edrich’s Last Report on the Miracles at Little No Horse is a Joan-clone among the Ojibwe Indians. Let’s have a Catholic urban legend with a twist. This one dates from before the Reformation and its sources are therefore entirely Catholic. And in a final twist, the first widely accepted refutation came from a Calvinist scholar. It is the legend of Pope Joan, allegedly the first and only woman elected pope. According to the story, she was pope in the ninth century during the so-called "Dark Ages" until her female identity was revealed. As old as the 13th century, and as recent as a 2005 ABC News "special," Pope Joan will be around as long as she serves an anti-Catholic purpose. She began as an anti-papal fable, persisted as nativist anti-Catholic propaganda, and has blossomed into a 21st-century feminist icon. In many ways, Pope Joan fits the traditional Catholic urban legend. Take any historical period and she can be molded into a solidly anti-Catholic niche. In the 16th century, Protestant dissenters used her to illustrate the nadir of an ever-corrupt papacy. In the 19th century, she was portrayed as a woman violated and ruined by lascivious clericalism, symbolic of the perversity to which Rome had sunk. In the 21st century, she represents the empowered female who fought the intransigent sexism of the Catholic Church and who therefore had to be destroyed. As with The Da Vinci Code, this latest bit of historical malarkey may provide some opportunities to discuss Church history and doctrine with folks. It will also be an opportunity to hear and endure more silliness, some of it sincerely naive and some it overtly nasty, from the usual suspects. It wouldn't surprise me if ABC or the History Channel had a special about how Pope Joan was both a Knights Templar, a Scottish Rite Mason*, and a Gnostic who was a direct descendant of Jesus and Mary Magdalene who also happened to pass along the sacred truths and secrets of ancient witchcraft, the pyramids of Egypt, and Tri-Lateral Commission—and who invented electricity, women's suffrage, and the Internet. * Updated, per the good comment below. Guardini believed that the spirit of the modern world was undermining the beliefs that made this liturgical consciousness possible. His insight here is that our faith and worship don’t take place in a vacuum. We’re always to some extent products of our culture. Our frameworks of meaning, our perceptions of reality, are shaped by the culture in which we live – whether we like it or not. I want to engage Guardini’s challenge in our current American context. Let’s consider some of the evidence: We live in a society where the organizing principle is technological progress, conceived in narrow, scientific and materialistic terms. Our culture is dominated by the assumptions of this scientific and materialistic worldview. We judge what is “true” and what is “real” by what we can see, touch and verify through research and experimentation. In this kind of culture, what meaning can there be for the traditional Catholic notion that the human person is created in the image of an invisible God; that the person is a creature of body and soul, infused with “the Spirit of sonship”ii through the liturgy and the sacraments? In practice, almost nothing of what we believe as Catholics is affirmed by our culture. Even the meaning of the words “human” and “person” are subject to debate. And other tenets of the Catholic worldview are aggressively repudiated or ignored. The question becomes: What implications does all this have for our worship -- in which we profess to be in contact body and soul with spiritual realities, singing with the angels and saints in heaven, receiving the true Body and Blood of our once dead and now risen Lord on the altar? IgnatiusInsight.com: There have been many books written about liturgical reform and what has gone wrong with worship within the Catholic Church. How is The Mass and Modernity different from other books addressing these issues? Fr. Robinson: There are many excellent books written about what has gone wrong. They are, however, "in house" books. By that I mean they discuss the worship of the Church within the framework of Church documents about liturgy show, often conclusively, that there is an enormous gap between what is in the documents and how episcopal conferences and diocesan commissions apply these documents. What I have tried to do in my book is to step outside this ecclesiastical framework and examine how the Enlightenment and Enlightenment-era philosophers, especially Kant, Hegel and their successors changed how people in the West understand and perceive God, man, society, religion, community, and much more. Then I trace the effect of those changes, noting how the worship of God is often radically skewed, even to the point where God is barely acknowledged. IgnatiusInsight.com: Some readers might be surprised that the names of philosophers appear more than those of theologians, including men such as Kant, Hume, Hegel, Marx and Comte. Why such an emphasis on philosophy? Fr. Robinson: To what I have just said, I would add that theology nowadays, at least the theology that seems most influential at the local level, does not seem to be a very creative discipline. It is in fact heavily dependent on themes marked out by the philosophers; and, moreover, these themes are often treated by using principles of rationality that have little to do with Catholic tradition. Perhaps that is a bit too sweeping, but it does seem to me that a good deal of modern Catholic theological writing is really philosophy of religion. It certainly does not appear to me as patient meditation on the revealed Word of God. It follows that we must go to the philosophers to come to grips with the currents of thought that are really influential. In the eighteenth century in Europe, the Enlightenment Catholicism of the day promoted "The State Church" as a means of controlling it. Austria was the most famous. It was a variation of what had been known for a long time in France as Gallicanism. But the model for each system required a monarch to assume the final authority over the church. What to do if you do not have a monarch? Those who are wary about the emergence of the "American Catholic Church" with its own identity separate from papal allegiance might do well to consider that there is available another precedent, one which did not require a monarch, and was even founded in reaction to monarchy as well as to papal fidelity. State control, or any faction's control for the sake of ideology, does not need a monarch at all. While the agenda differs today, and history may not repeat itself exactly, there may still be something to be learned.